It can be challenging to come up with flower centerpiece ideas for events that are male oriented, like birthday parties, sports-related celebrations or bachelor parties. Many florists in larger metropolitan areas offer beer mug arrangements, where white flowers in a clear beer mug filled with amber acrylic chunks give the look of foaming beer. But you'll need more than one for centerpieces, and that can be expensive. Making beer mug arrangements yourself can be cheaper and a lot more fun. Adhere a strip of white plastic tape along the outside edge of the rim of your acrylic beer mug. Be careful not to place it on the lip of the mug, but go right to the top edge without creating any wrinkles in the tape. This white strip will hide the stems of the carnation 'foam' and give the appearance of a head of foam on the beer. Fill the mug with the amber-colored acrylic rock chunks or marbles. These will keep your mini-carnations in place, plus give your arrangement the look of beer in the mug. If you have difficulty finding them, an alternative is to carefully line the inside of your mug with amber cellophane. Be sure to have the edges of your amber cellophane meet and slightly overlap at the handle of the mug is so it will not be detected. Add to the beer mug clean, room temperature water that completely covers the acrylic rocks and is almost to the rim. Cut the stems of your white mini-carnations to lengths of 4 to 4 1/2 inches. Your mini-carnations need to be cut fairly uniform in length, with the ones for the center of your arrangement slightly longer by 1/2 inch so the carnations form a dome shape of flowers when the arrangement is done. Begin placing the mini-carnations with the 4-inch stems around the rim of your beer mug. Keep the stems pointed toward the center of the mug, not straight down. Place your mini-carnations very close together as you line the outer edge. Continue to add your mini-carnations to the center of your beer mug centerpiece, using the longer-stemmed blossoms. Place them tightly so there are no open areas. Keep them at a similar height, but slightly domed, so when completed, the flower surface appears smooth, without one or two flowers sticking up higher. This will give the appearance foaming beer. Be sure to check and keep the water level up for your flowers in the mug. Because the stems have been cut short and placed at an angle, they are not able to reach down to lower water levels. You may be tempted to use food coloring to color the water instead of using amber-colored rocks or marbles. Don't! Carnations are one of the easiest flowers to colorize by inserting their stems in colored water. 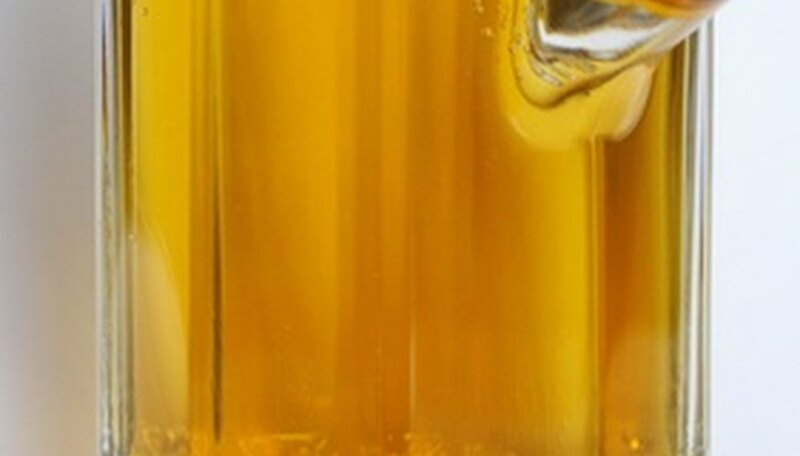 Your white foam will quickly turn amber if you tint your "beer" water.